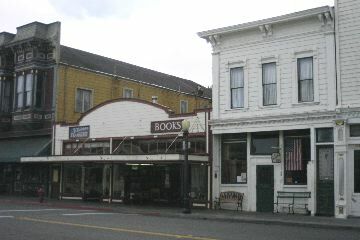 Ferndale's Main Street is lined with late nineteenth and early twentieth century redwood storefronts. Many have false fronts, others abut each other so closely there are rumors of secret passages connecting them. 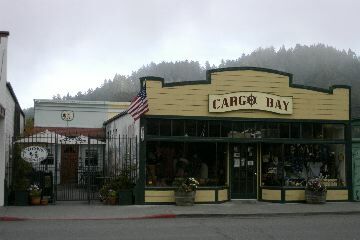 Main Street is visually dominated by the Wildcat Hills and local tradition draws the south end of the street at the top of the page. This is continued in this table which flows from South to North. 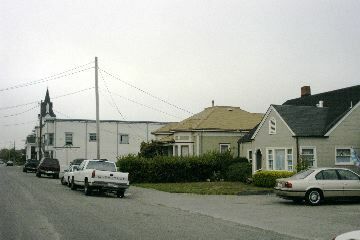 South of Ocean, Main becomes Francis Street. 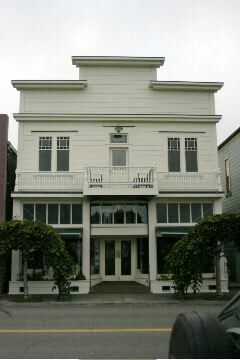 212 Francis -- The 1891 Masonic Temple is an example of Eastlake-Stick architecture. 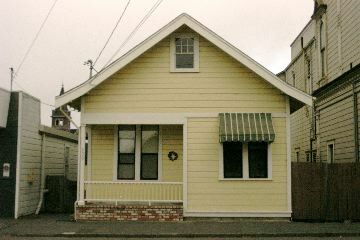 207 Francis -- This Victorian cottage was built for Dr. Alford in 1884. 230 Francis -- The 1899 Thomas H. Faulkner House adjoins the temple. 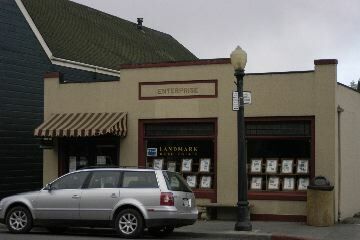 219 Francis -- The Enterprise Office is a commercial false-front that was built in 1881. A parking lot separates this building from the Bank. 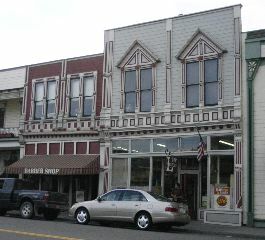 248-250 Francis -- the 1899 Faulkner Building houses the Ferndale Enterprise. 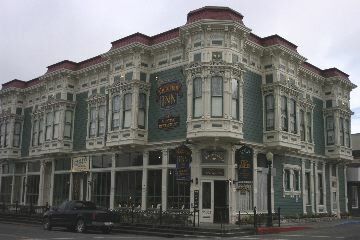 400 Ocean -- The Victorian Inn was built as the Ira Russ Bank Building in a style described as Eastlake-Stick. It was designed by T.J. Frost, Architect in 1891. 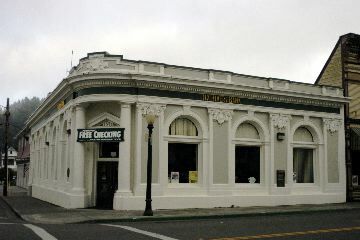 330 Ocean -- The U.S. Bank Building is a 1977 neo-Victorian built to complement the rest of the buildings. Bill McBride for scale. 300 Main --The moderne 1949 Larsen's Dodge Service Station sits empty. 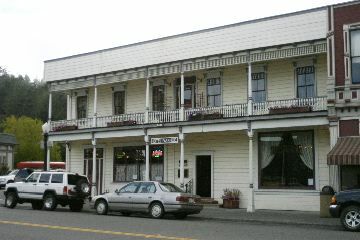 315 Main -- The Hotel Ivanhoe was built in 1875 and has been the Robert's Hotel and the Ferndale Hotel at different times in its history. 334 Main -- The Enterprise Building was built in 1923 and is unique in its concrete construction and moderne styling. 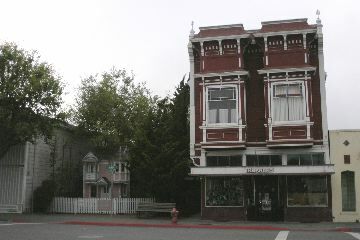 325-327 Main -- This 1898 pair of storefronts known as the Taylor Building has housed many things over its history including the post office in 1889. 344 Main --T.J. 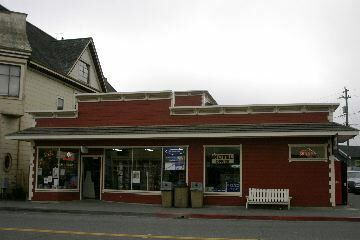 Frost designed the Ferndale Reliable Store with an Eastlake-Stick facade in 1900. 350 Main -- was built as T.H. Brown's Office Building by putting up what is known as a Victorian False-front in 1902. 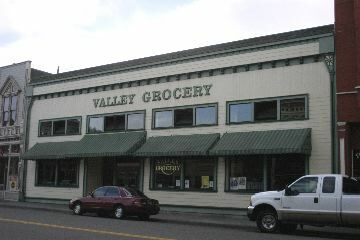 339 Main -- The Valley Grocery is the former site of the Brick Store which was just built in 1906 when the great earthquake which destroyed San Francisco also badly damaged Ferndale. 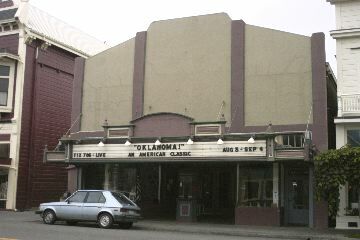 It was rebuilt and destroyed again in the 1992 Petrolia earthquakes. 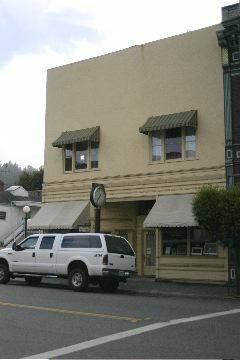 358 Main -- was built in 1928 and while considered a modern building has been ornamented to match the rest of Main Street. 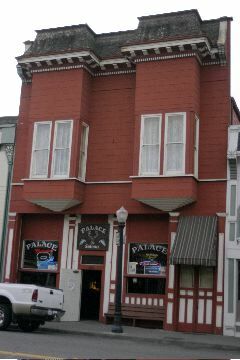 353 Main -- The Palace Saloon holds the distinction of being the farthest west tavern in the lower 48 United States. 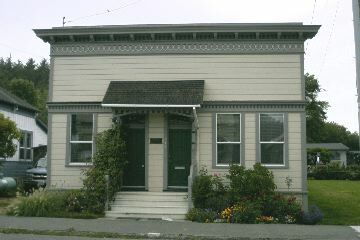 It is in a 1902 Victorian False-front with street and alley entrances. 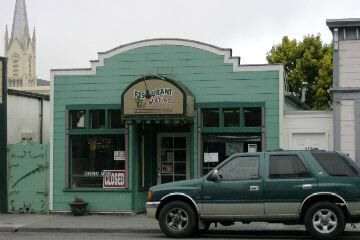 362 Main -- was built as the business it now is, Ring's Pharmacy. It was designed by T.J. 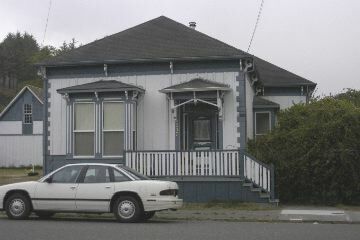 Frost, Architect in 1896 in an Eastlake-Stick style. The upstairs apartment was designed for the pharmacist's family home. 361 Main -- The 1902 D. A. Branstetter Building was built as a Victorian False-front. It once was the Candystick gallery of Viola McBride. 376 Main - The 1902 Z. Russ and Sons Meat Market was designed by T.J. Frost, Architect in an Eastlake-Stick style. 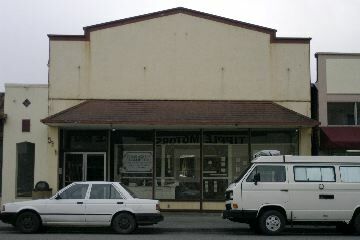 The Ferndale parking lot was once the site of the Gilt Edge Hotel and the set for "The Majestic" movie palace. Stones mark the 1952 Centennial and the Viola Russ McBride Dedication Plaque. You can see Francis Creek under the bridge at the back of the lot. 394 Main -- The 1911 Neo-Classical Ferndale Bank building adjoins the 1915 Ferndale Volunteer Firefighters Hall on the Brown Street Side. One of Ferndale's sirens is on the roof of the firehall. 385-389 Main -- This building was started in 1894 as the Dan A. Branstetter Building and added to in 1947. In front is the Town Clock built in 1923 and still keeping perfect time. walk this way to the Gingerbread Mansion----- Brown Street 393 Main -- was built in the Eastlake-Stick style in 1896 for P.F. Hart. 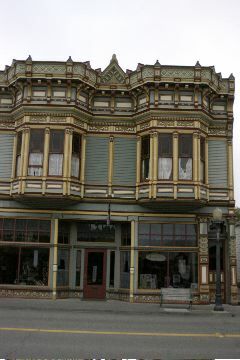 It has been at various times a stagecoach stop, a saloon, a gambling hall, a house of prostitution and an art gallery. 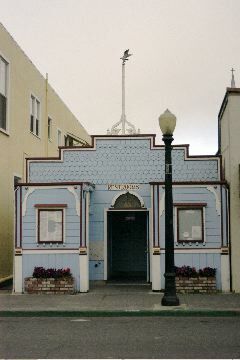 The Kinetic Sculpture Race was founded in this building in 1969. 406 Main -- The Newell and Lentz Department Store was built in 1897 and then changed to Streamline Moderne in 1948. 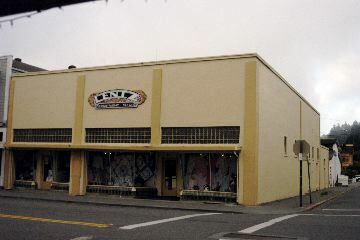 It is now the Lentz Deparment Store. 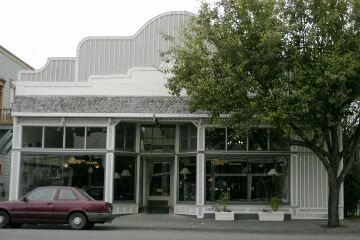 399-405 Main -- The New Hart Building was built in 1924 in Mission Revival Style. 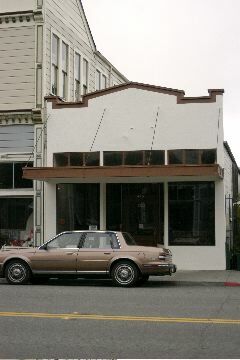 409 Main -- A tiny Italianate storefront was built by Alford's Drug Store in 1887 and is now a breakfast/lunch restaurant. 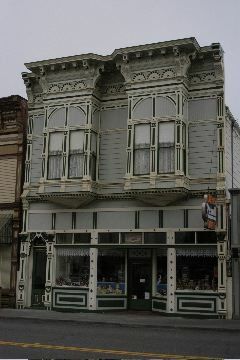 424 Main -- This Victorian False-front was built in 1894 as the James Mullady Building and currently houses a hardware store. 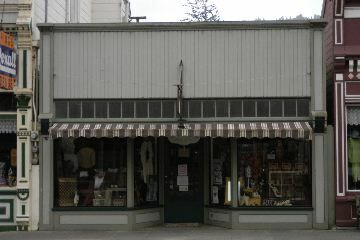 421 Main -- The Golden Gait Mercantile occupies the H.J. 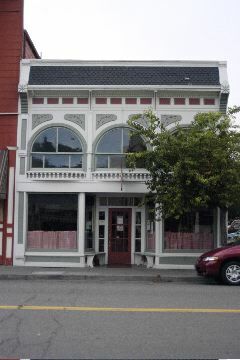 Mueller Building that was built in 1893, and modified in the 1930s and the 1970s. 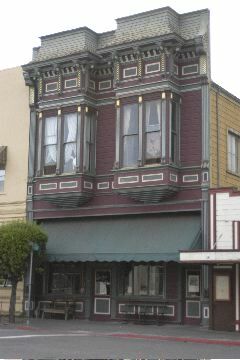 430-436 Main -- was built in 1891 as a Victorian False-front known as the M.P. Meng Building. 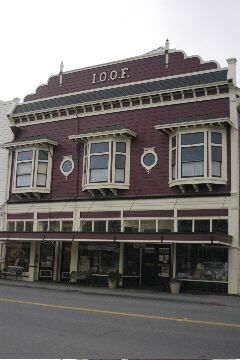 425-431 Main -- was the I.O.O.F. 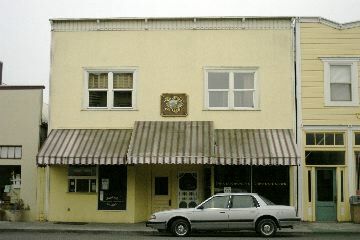 Hall (International Order of Oddfellows). 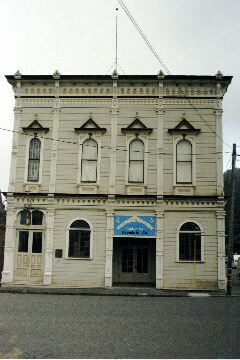 Other sources say the Victorian False-front building was built as Ferndale's first Masonic Hall in 1875. 452 Main -- is an 1870 residence joined to an 1918 storefront. The building is called the Gangreen/Ward/Gill House. 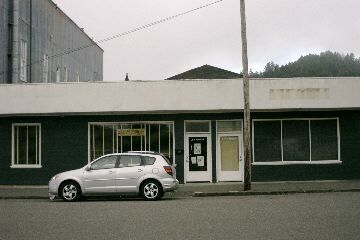 441-451 Main -- The Hart Theatre was designed by F. Georgeson, Architect in 1920 and currently houses the Ferndale Repertory Theatre. 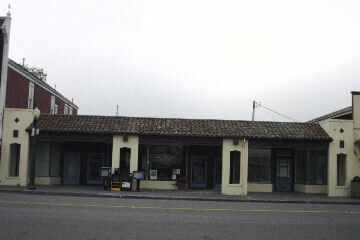 460 Main -- was built in 1924 in Mission Revival style to house the Eel River and Southern Telphone Company. 455 Main -- The G.W. 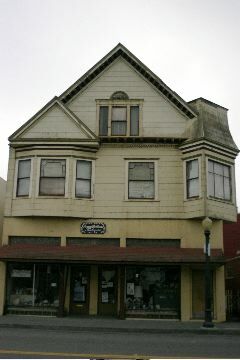 Williams Building was built in 1888 and modified in 1954. It now houses the Blacksmith Shop. 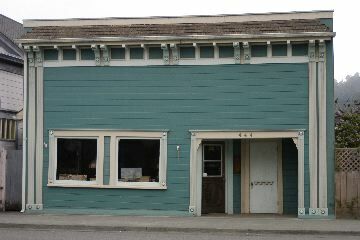 468 Main -- is a modernistic storefront built in 1936 for F. Dahlquist Plumbing and Electrical. A side court leads to a restaurant. 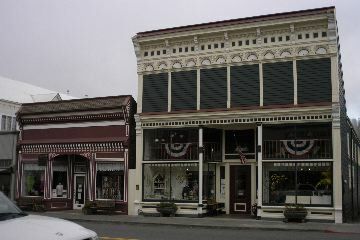 475 Main -- was built in 1898 as the New York Cash Store in the Eastlake-Stick style by T.J. Frost, Architect. 476 Main -- The Gill/Hiller Building was built as a commercial false-front in 1891. 491 Main -- The Williams Building was begun in 1895 and modified in 1954. 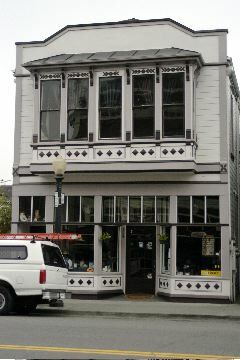 505 Main -- This unusual Italianate storefront occupies the Old Red Front Store, now Abraxas ("Warehouse for Wizards") . Washington Street 513-525 Main -- The Mission Revival Kemp Building was finished in 1930. 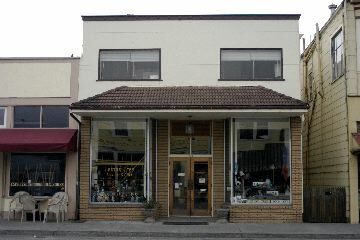 One of its storefronts was the pet store in "Outbreak." 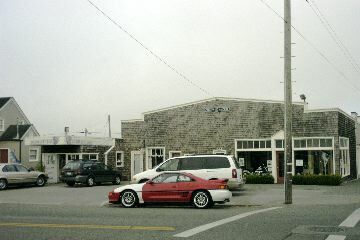 524 Main -- The Modernistic Petersen's Service Station was built in 1930. 535 Main -- The R.H. Edwards Building was finished in 1902. 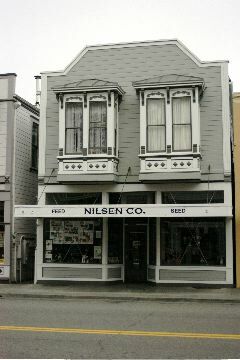 It now serves as the headquarters for a restoration carpenter. 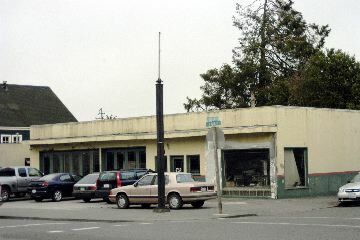 Ferndale Public Restrooms were built in 1982. 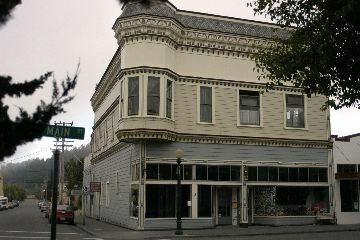 543 Main -- was built in 1901 for Hiram Hatch. 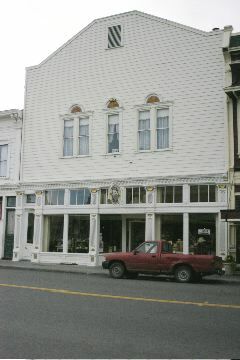 536 Main -- was built in 1888 as a commercial False-front called Doe's Hall. 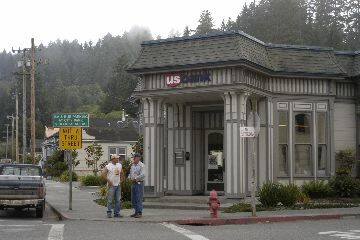 Modified in 1946, it now serves as Ferndale's Post Office. 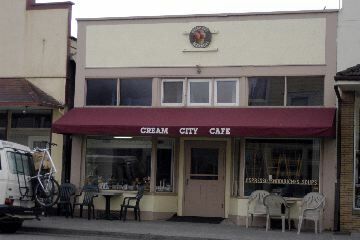 553 Main -- The Home Cafe Building was built in 1950. 554 Main -- This commercial False-front was built for the same person as 536 and was called the Doe Building when it was finished in 1895. 561-563 Main -- Foggy Bottoms Yarn shop occupies a Neo-Classical storefront built for Charles A. Doe in 1901 and modified in 1948. 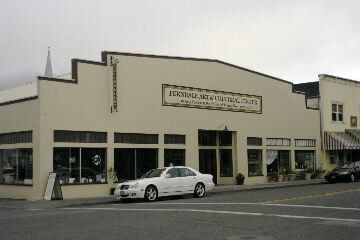 580 Main -- The Ferndale Art and Cultural Center is home to the Kinetic Sculpture Museum and many artists and artisans. 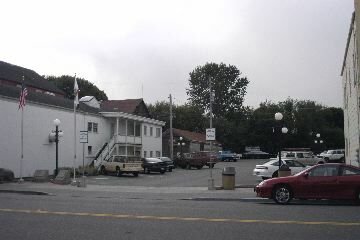 577 Main -- The Pixley-American Hotel was torn down and the Red Front Store and Francis Creek Inn was built in 1960. 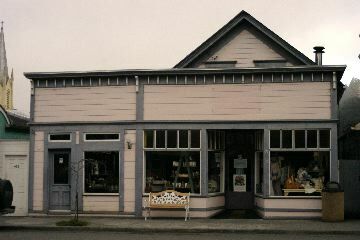 606 Main -- This low commercial building houses a tea shop and a jam store. 607 Main -- was the site of Ferndale's Pythian Castle which suffered damage in the 1906 earthquake and had to be torn down. 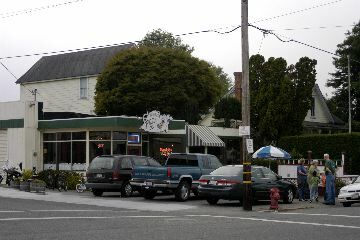 The site was then a Gas Station and was fully remodeled into the popular Ferndale Pizza Company. 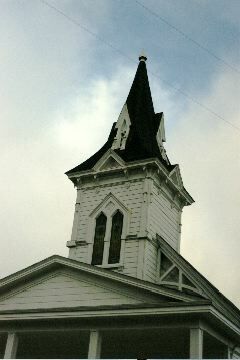 Ferndale Congregational Church is at the intersection of Main and Shaw. 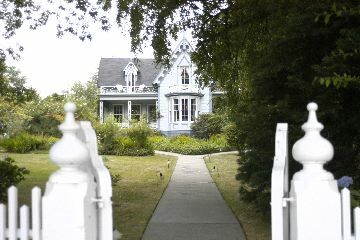 703 Main -- The Shaw House is the oldest building in Ferndale, dating to 1854 with additions in 1866 and ever after. 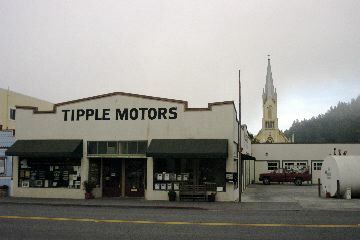 It was built by town founder Seth Shaw and called "Fern Dale." 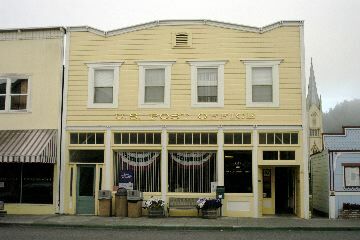 The building housed the post office and is now a bed and breakfast. Thanks to Ken Mierzwa for helping with this page, and Alberta Harlow for suggesting it.
. 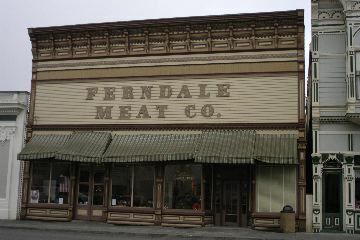 Images of America Ferndale.
. Historic plaques on some of the buildings.